Welcome back, my friends, as we celebrate the weekly linkup of me actually getting dressed during the day. Having the lovely Alison pick out my outfits for 21 days has definitely cut down the arguments I have with myself on what I should wear. Thursday: striped dress, bright handbag, bright flats. Still chilly here, so I had to add leggings. I got to wear my new dress from Simons, and I paired it with shades of green. Green Marc Jacob bag, Mint Green ballerina converse and then my military jacket for warmth. I had a work get together in the evening and wanted to be comfy, so I switched out the denim for the dressy joggers. Chambray: Cloth & Stone (carried at Anthropologie) this shirt is insanely soft...I like this or this! We had brunch club and this was super cozy, except it started blizzarding and then I got Nutella on my pants. Everything is better with Nutella, except white jeans. Snow. Bleh. We've been on our acreage for 2 years and haven't used the snow blower once...we totally could have on Sunday. All old and covered in 30 cm of freshly fallen snow. The sun is out, the snow is melting. There is hope. I also got to wear the new shirt I got in Calgary and the grey jeans I got for the winter challenge. I had a lovely outfit planned and then got too lazy to shave my legs. I then had on a pretty old dress (ModCloth) and was ready to hit up Costco and then felt too fancy. So I changed again. Oy. Check out what these ladies have been sporting! 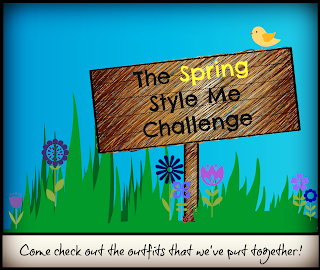 And come back Friday for another fun Style Me Bloggers link up! My fave accessory this week is your facial expressions! I live the floral shirt you changed into. I didn't realize it was so long in the back! LOL re: shaving your legs. Ya, I forgot too. - That last shirt - LOVE!!! You always look great in whatever you are wearing! I love that your personality truly shows! That first outfit is my favorite! The nautical top, the bright flats, oh my! Perfection! Hey i bought that same floral top from H&M! I can't wait to wear it too. And that snow...oye! I love it all! And I want a pair of camo flats asap. that modcloth dress is so so pretty! I'm still in love with your face in the snow pic lol, mine would be the same! Love the snow pic and that outfit!! Now I think I need me a pair of joggers!! Love watching the changes in your weather from one picture to the next, as well as the changes in your mood! Cannot believe you guys got THAT much snow in April. So many really great pieces in your "spread". Love the H&M sheer, sleeveless top, those crazy-bright flats, your whole snow day outfit! You always take the OOTD and make them uniquely yours. Ok, I love Nutella but I hate snow in the spring. I love all of your floral pieces and that chambray top. Get out - crazy cute! Woah! That is a lot of snow! The only positive of April snow is that it doesn't last long. Oh, and your line that everything is better with Nutella, except white pants made me laugh! Aw, very sweet of you. Thanks. Twinnies! but with opposite weather, of course. I think you and I think the same way. You should get some ! They are super cozy and can pass as dress pants! I can't believe I actually found a chambray I like.